IRVINE, CA--(Marketwired - Nov 4, 2015) - Young homebuyers looking for a prime opportunity to own in Irvine's Cypress Village are attracted to Zinnia's new townhome collection by California Pacific Homes. For single professionals and young couples, Zinnia's Residence One is the ideal choice with innovatively planned living areas, two private bedrooms with en-suite baths; a chef-inspired kitchen with island seating, Bosch appliances and Pental Quartz countertops; covered outdoor deck; and two-car attached garage from the high $400,000s. For more details on Zinnia's Residence One, or to learn about fall and year-end move-in opportunities, visit the sales office or log on to www.calpacifichomes.com. 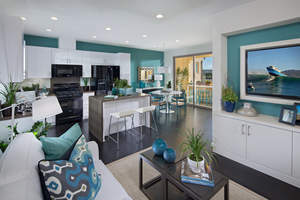 "Zinnia offers a variety of floorplan styles designed to accommodate the lifestyles of every buyer, and that includes first time buyers who are ready for homeownership," said Leslie Stillman, Vice President, Sales & Marketing and Design Center for California Pacific Homes. "Our Residence One is an ideal design for first-time buyers who want the luxury of a brand-new home in one of Irvine's most vibrant locations." Featuring low maintenance two- and three-story attached designs, Zinnia is conveniently close to resort-style amenities including The Jeffrey Open Space trail. Contemporary interiors offer two to four bedrooms, two and one-half to three and one-half baths and a two-car attached garage. With approximately 1,163 to 1,531 square feet, Residences One and Two include a covered deck off the dining area for intimate outdoor entertaining; Residences Two and Four have a convenient downstairs bedroom; and Residence Three offers a private courtyard and three bedrooms that includes a master suite with walk-in closet on the second floor. Prices start from the high $400,000s to the low $600,000s. Cypress Village, within the Villages of Irvine®, offers residents everything families want and need to thrive now and in the years to come. Offering the next generation in new home designs, Cypress Village provides residents with resort-style recreation for the young and young at heart, a convenient setting near your favorite places and acres of parks for fun in the sun, and is conveniently located just moments away from the region's premier shopping, dining and entertainment. Students attend the state-of-the-art Jeffrey Trail Middle School and the newly opened Cypress Village Elementary School, both conveniently located within the Village and part of the heralded Irvine Unified School District. Created by Irvine Company Community Development, Cypress Village is conveniently located in Irvine, California. In 2014, Money Magazine named Irvine California's No.1 city in its "Best Places to Live" list. The highly acclaimed master-planned community is renowned for allowing residents to enjoy a unique lifestyle unmatched in the region -- some of the best schools in the state; America's safest city for eleven years in a row; abundant open space, parks and recreational opportunities; and world-class dining, entertainment and employment. For more information about the Villages of Irvine, visit www.VillagesofIrvine.com. To visit Zinnia, exit I-5 at Sand Canyon and turn left. Turn left on Nightmist, then left on Tulip. Located at Tulip and Evening Sun, the Zinnia models and sales office are open daily from 10 a.m. to 5 p.m. For more information, call 949.502.5373. Residence One at Zinnia offers innovatively planned living areas.